A keyless, electronic wi-fi capable access control system. 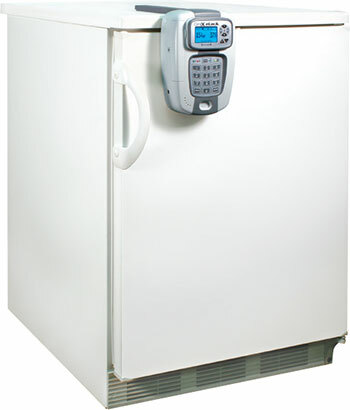 The eLock can be used in many applications - drug & supply cabinets, refrigerators and freezers, emergency vehicles - anywhere access control is needed or required. 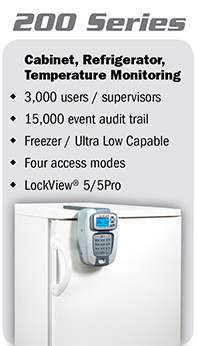 The CompX eLock is a device that provides access control with audit trail capabilities and/or temperature monitoring (if needed) for a variety of applications — drug & supply cabinets, refrigerators and freezers, ultra-low freezers, incubators, patient and personnel records cabinets, key control cabinets, hazardous material storage, tool storage, evidence lockers and anywhere else access control or temperature monitoring is needed or required. 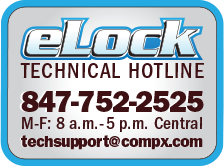 CompX eLock is unique from most locking devices. 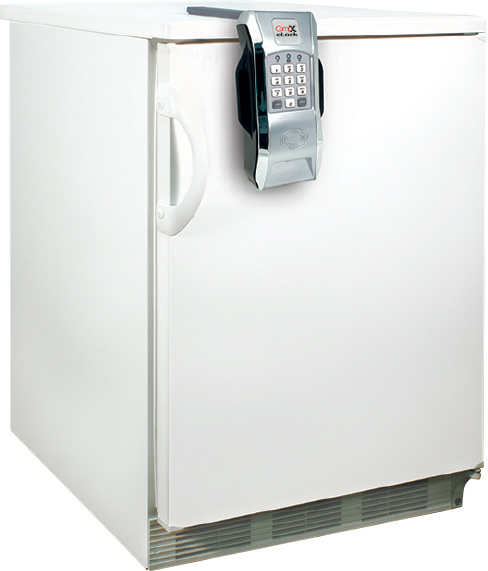 It is a keyless system — there are NO keys to lose or share. 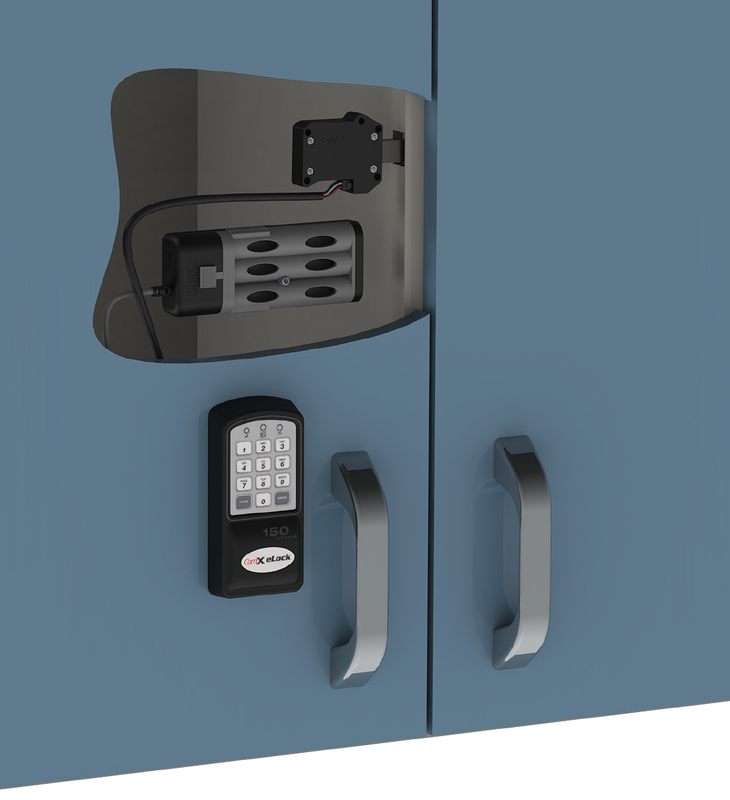 The eLocks can be programmed to read facility's existing employee identification cards using HID proximity, HID iCLASS proximity, or magnetic card credentials. Using existing identification cards eliminates the need to buy new cards. However, for facilities that do not have a compatible credential system, eLocks can be programmed with personal identification numbers (PIN). No matter what access mode is used, the eLock makes securing valuables easy. Since the latch is a spring bolt, simply close the door, and the motor-driven latch provides the convenience and security of automatic relocking. 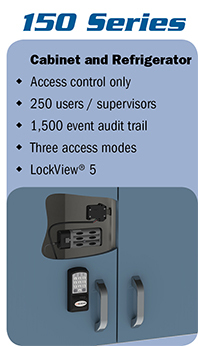 Another indispensable feature of eLock is the ability to produce an audit trail (through LockView software). An audit trail report will provide information on when an individual was allowed or denied access - providing accountability and complete access control. LockView also allows the administrator to add, edit, view and delete users/eLocks, assign access rights, create user groups and create time-based access restrictions. The presence of a reliable and easy-to-follow audit trail is an indicator of good internal controls instituted by an organization. 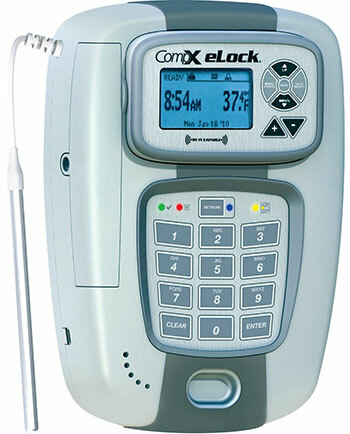 The CompX eLock is the only product available that offers both temperature monitoring and access control — all in one device. Temperature monitoring provides a solution to replace manual chart recording by automatically recording temperatures at programmed intervals, thereby eliminating human error. Minimum and maximum operating temperature ranges can be set within 100°C to -100°C. All CompX temperature monitoring devices can record up to 500,000 temperature data points. With LockView 5 software, programmable charts, graphs and reports are easily created using temperature logs and audit trails. 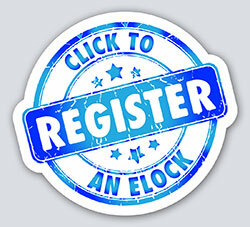 Click to learn more about Access Control options available on CompX eLock. There are two temperature monitoring with access control versions available: Network (300 Series) and Non-network (200 Series). Temperature monitoring provides a solution to replace manual chart recording by automatically recording temperatures at programmed intervals, thereby eliminating human error. The eLock with standard temperature monitoring, monitors internal temperature of 100°C to -40°C; ultra-low temperature monitoring, 100°C to -100°C. All CompX temperature monitoring devices can record up to 500,000 temperature data points. With LockView 5 software, programmable charts, graphs and reports are easily created using temperature logs. 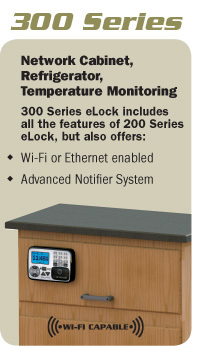 There are two temperature monitoring only versions available: Network (300 Series) and Non-network (200 Series).